Cultured, riverside Bonn was thrust into the limelight when it became the ‘temporary’ capital of West Germany in 1949, but it developed such a governmental, regal sort of stately standing that there was quite a bit of surprise when the capital was moved back to Berlin in 1991. 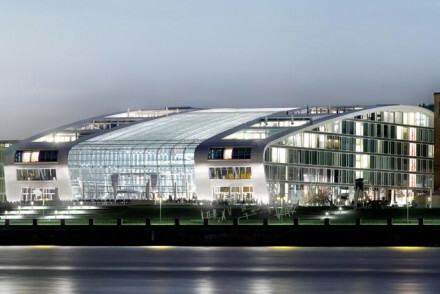 Our Guru’s recommendations for the best places to stay in Bonn include a rather lovely riverside hotel with a large beer garden, a hotel so futuristic in design it looks a bit like a space ship and a wonderful forest hideaway which is still only 4kms from the centre of town. The government quarter is now repurposed, and its grand state buildings have become super popular for large scale exhibitions. It’s definitely worth a stroll around for the architecture alone. If you know anything about Bonn then you might be wondering how it was possible to go two paragraphs without mentioning that this is the birthplace of Beethoven, who was born on Bonngasse, in a house which is now a museum. Bonn’s Münster Basilica, Gothic on the outside and Romanesque on the inside, and built on Münsterplatz is another extremely important historic site. This is where the city was founded, on the spot where its two patron saints were martyred. Yes, Bonn has an extremely interesting, and at times bloody, backstory! For more recent history visit the Haus der Geschichte, which charts recent German history, from the end of WWII until now. Or try the Deutsches Museum Bonn, which is all about German technology from the same period. There’s also an excellent Kunstmuseum and the world class Kunst-und Ausstellungshalle der Bundesrepublik Deutschland, Bundeskunsthalle for short (or the Art and Exhibition Hall of the Federal Republic of Germany), which is one of the country’s most popular museums, and known for its ever-changing art and cultural history exhibitions. Bonn has several other excellent art museums, and some slightly niche charmers, which are certainly worth checking out if time permits. Don’t miss the Poppelsdorfer Schloss and its beautiful botanical gardens. Or the university for that matter. They also do a lovely Christmas Market and a Beethoven Festival every September. Bonn is just 20kms south of Cologne, and Düsseldorf is also an easy day trip away, so it makes for a great base for exploring this rather romantic stretch of the Rhine. Frankfurt is less than an hour away on the train. Our pick of the best places to stay in Bonn are popular properties, so if you want to make sure you get the best of the bunch, do yourself a favour and book well ahead. 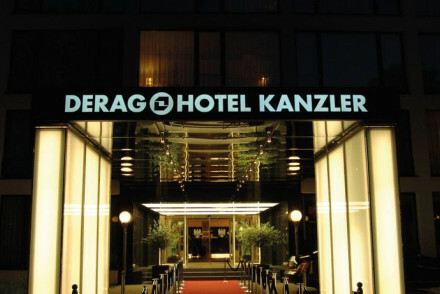 The Derag Livinghotel Kanzler is a smart hotel in the heart of Bonn’s ‘Museum Mile’, with a range of spacious suites - some complete with living and dining areas - rooms and serviced apartments. There’s a bar, gym and spa and a cosy restaurant. Impressively converted from a college, the comfortable, minimalist Collegium Leoninum is perfectly positioned for Bonn’s highlights. There are 70 rooms and an elegant restaurant. And the room rate starts from around €126 per night. For something a bit more traditional try the Sternhotel, equally well located, just with a more ‘comfortable’ finish. There are 80 contemporary rooms and the hotel does indulgent breakfasts. 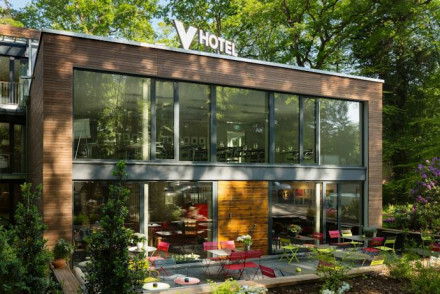 The V Hotel is a design hotel in a small forest, just outside Bonn proper. There are 42 rooms in a wonderful, angular, wood and glass building or arranged in tree-houses around the forest - which are perfect for anyone looking for complete privacy. It feels very peaceful but you’re actually only 4kms from the centre of town. The Kameha Grand is a super modern hotel right by the river. It looks a bit like a space station, and has futuristic decor throughout with 254 large, individually styled rooms and a choice of restaurants. 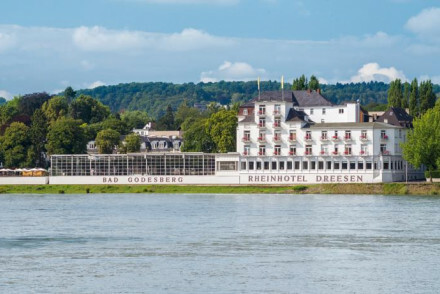 Also just out of town, but this time further along the Rhine, the Rheinhotel Dreesen is an elegant riverside hotel with wonderful views and a large beer garden and restaurant specialising in regional cuisine. You’re just 8kms from Bonn. The Villa Godesberg is a stylish, contemporary hotel converted from two art nouveau villas on the outskirts of Bonn. There are 24 rooms, which are spacious and neutrally decorated, and they offer complimentary bike hire and breakfast in the conservatory. For somewhere all to yourself, explore the options at our online partner Booking.com. The best airport for the city is Cologne Bonn Airport, situated about 25km north of the city. The best time to visit Bonn is from June to September when the weather is at its best. However Bonn is a year round destination, so do try to plan your visit in advance. Browse through our list of all the best places to stay in Bonn. Explore our selection of the best places to stay in Frankfurt or expand your search to include all our properties in North Rhine-Westphalia. 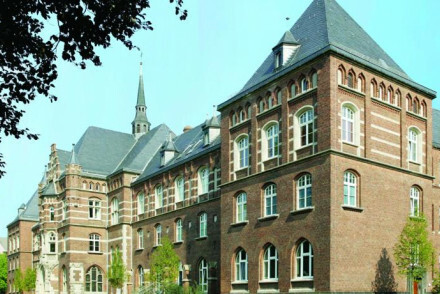 An imposing converted college with very modern interiors. Minimalist rooms with large sash windows, wonderfully comfortable beds and uber modern bathrooms. International cuisine served up at the elegant Leo’s Bistro. Well positioned for accessing Bonn's attractions. A comfortable stay. Local exploring - A stylish hotel with a great central location, and a spa to ease your weary limbs- ideal for exploring the city. Great walks - Take a hike through the stunning Naturpark Siebengebirge. 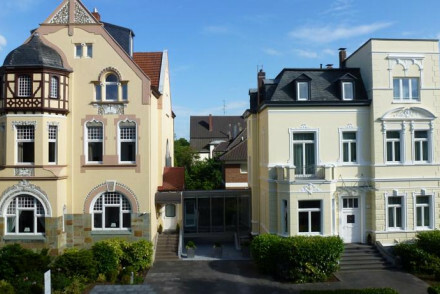 A stylish and contemporary hotel set in two art nouveau villas on the outskirts of Bonn. The modern rooms are spacious and comfortable, boasting neutral tones and original art. Breakfast is served in the conservatory and complimentary bikes are offered for exploring the local area. Local exploring - The comfy beds and hearty breakfast make this the perfect launchpad for exploring the region by bike or on foot. Great walks - There is something for every taste, either explore the town on foot, or head off along the River Rhine. Sights nearby - Music lovers will be pleased to hear that Beethoven's House is just four miles down the road. A 4 star hotel excellently placed in the heart of Bonn. Individually styled rooms with traditional large sash windows and contemporary design. Indulgent breakfasts served. Just steps away from many of Bonn's sights makes this an ideal base for exploring the city. Local exploring - Well positioned in the marketplace of Bonn city centre and a walk from the river. Sights nearby - Just steps from the Town Hall and market place. Great walks - Take a stroll along the River Rhine. A design hotel situated in a small forest within the city of Bonn. A wooden and glass building seems to disappear into the surrounding trees. Find tree-houses dotted through the forest for guests wanting complete privacy. Contemporary design throughout. Just 4km from the city centre. A city haven. Hideaway - A tranquil design hotel just 4km from the centre of Bonn. Sights nearby - Make a trip to the historic centre visiting the market place and town hall. An elegant riverside hotel just outside the city of Bonn. Large, light rooms with soft hues and private balconies. Opulent banquet halls with wonderful river views. A large beer garden and regional cuisine served in the restaurant. A fabulous venue for any event. Weddings - Opulent event rooms with lovely river views - a wonderful backdrop for a wedding. Local exploring - An elegant riverside property just 8km from Bonn. 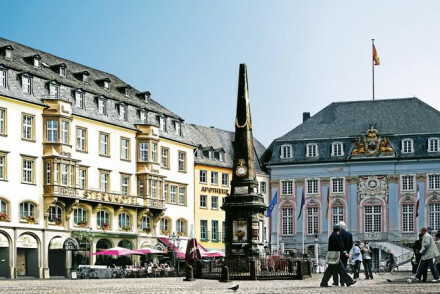 Sights nearby - Just a short drive away is the city of Bonn. Take a day trip and explore its sights. Great walks - Take a stroll along the Rhine River. Smart hotel located along Bonn's Museum Mile. Comprised of spacious suites, complete with living areas and some, dining-areas, as well as serviced apartments this hotel is equipped to suit all needs. A continental breakfast is served plus there is a cosy restaurant, bar as well as gym and spa. A large uber modern hotel close to the city centre. Fabulous views of the Rhine valley from the rooftop pool. Contemporary, bordering futuristic style throughout. Rooms are large and individually styled. A number of dining options including an excellent Japanese restaurant. City chic. City Style - A sleek modern hotel with excellent restaurants, a swish bar and a spa for unwinding. Sights nearby - Visit the imposing 11th century Bonn Cathedral.